One such facility of the planetarium is in Patna Bihar. Patna Planetarium also called Indira Gandhi Planetarium since it is situated in Indira Gandhi science complex, Patna. It is commonly called and famous in name of Patna Taramandal. Patna planetarium was a project started by Bihari council on science and technology at a total cost of 11 crores this is a gift by the Bihar chief minister Shri Satyendra Narayan Sinha who conceptualized it in 1989 with its construction beginning in the same here it was opened for the public visit on 1st of April 1993. Stars, planets, and galaxies, they all silly fascinates most of us but it’s not possible for all of us to have a sight of all these heavenly bodies. Luckily in this fast-changing advanced technological world, we have something to fulfill such wishes. The Planetarium is one such example of technological advancement. It is an artificial environment that can let us have a sneak peek into our solar system and have a beautiful view of stars, planets, and galaxies and the real beauty of India. This Planetarium attracts and observes a large number of domestic as well as foreign tourist. It is a place of attraction for both the children and adults. It is one of the largest planetariums in the whole Asian continent. This Planetarium runs regular film shows related to the subject of astronomy or the space science. There is a wide variety of the film shows it has a well-maintained Complex and then excellent auditorium the maximum seating capacity in the main hall is of 276 people they have a huge dome-shaped screen on which these fascinating films are showcased the visitors look up and immerse themselves into the display and enjoy the amazing feeling of watching sky consisting of stars, planets, and galaxies. It is facilitated with complete surround sound having a crystal clear quality which makes the experience even greater. It remains open 6days in a week and observes shutdown on Monday. It is operated from 10 to morning to 5 of the evening. The show timings start at 12 noon and the shows are in every one or two hours. Not to forget about the pricing part of it, one can experience such wonderful thing at a minimal cost of rupees 50 only. There is no cost for a child age less than 3 years. It also holds exhibitions from time to time which is the major reason that lakhs of visitors come here in a year. A record ten lakh visitors were observed in the year of 2007. Talking about the technical aspect of this Planetarium, the Patna planetarium uses a traditional opto mechanical projection of celluloid film. This Planetarium faces some criticism as well. Unlike the most modern Digital projectors available today, this planetarium uses the Opto mechanical system to show the films which are difficult to change because of which the same film is shown for years. It is mainly because the time at which this planetarium was constructed there were not many advanced options available as we have today. 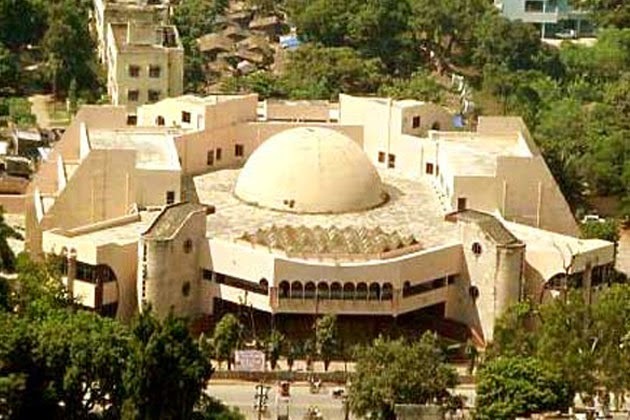 This Planetarium is going to face a huge competition and is expected to be a major setback as the Bihar is going to get its first digital Planetarium in coming years from the premises of Sri Krishna Science Centre near the Gandhi Maidan in Patna. It is has been developed at a total cost of rupees 5 crores and is facilitated with one of the best digital projection system present today.